When visiting Pokhara visiting the Phewa Lake is a must. 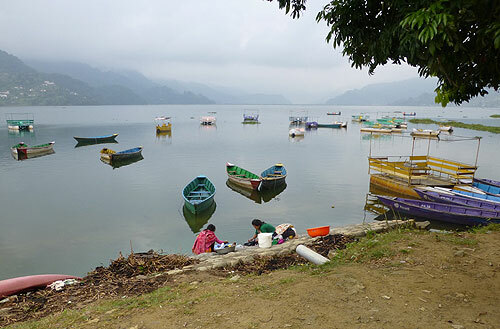 The Lake is second largest in Nepal, 2,400 feet above sea level and 5.3 sq .km. The beauty of the Lake along with the views of the Annapurna Mountain Range has made it into quite a tourist attraction and the further north you go along the Lake's long Promenade walk you will see there is quite a lot of Hotel development springing up. The best time of the day to walk this stretch is early to mid morning when you see the local people going about their day to day life; some doing their washing, some fishing, some playing and others commuting by Boat to the other side. The small Harbour Pier is amok with people either waiting for a Boat or generally passing the time of day. There are also many boats for Tourists to experience 'life in the slow lane' and enjoy the peace of it all and / or visit the Barahi Temple which is on a small Island. For sport minded people there are various activities for you to enjoy around the Lake including Paragliding, Swimming and canoeing. 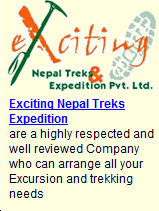 Trips can also be arranged for White River Rafting along the Kali Gandaki, Marsyangdi, Trisuli or Seti rivers. One can easily spend a day here, there is a selection of Cafes and Shops lake side and although Pokhara is known to be more expensive than Kathmandu, things are pretty low cost. Of my time in Pokhara, it was here I enjoyed the most. Catch the right time and you're pretty clear of Tourists and can see the real Nepal. A long walk along the lake side pathway is realaxing and eye opening.